Note: Once your port to FreedomPop is completed, the Carrier the number came from will close the account. If you wanted to keep that account open, please contact that carrier to make other arrangement prior to porting. It can take 24-48 hours for the Port to go through and 5-7 days for land lines or VOIP numbers. If FreedomPop has any issue with the number it can take upwards of a week. If the port is unsuccessful, your CC/Debit will be reimbursed the 9.99$ charge. FreedomPop will send you an email confirmation once you port the new number and an email confirmation once the port is successful. If for some reason, the port does not go through, please contact your old carrier. They are responsible for the releasing the number for porting. Make sure that you have a number on the FreedomPop account before you port (we called this your temporary number or the old number used before the port, but you do need one or it won’t accept). Also some carriers require you to have an account with them for so long before they’ll release the number for a port. Make sure you keep that phone activated till the port is 100% successful. Keep that other carrier phone active, ensures you don't lose the number, if the port is unsuccessful. After the port goes through, please update the profile and PRL. Most Androids you find this in Settings>Update System/Update Phone. IPhones please do a Service update- Open the native dialer and on the keypad, dial ##873283# and tap the Call icon. Would you please help me with porting out my phone number from Freedompop to my new carrier T-mobile? I submitted ticket about porting out issue but have not received any response. My phone # is 425 922 4730. 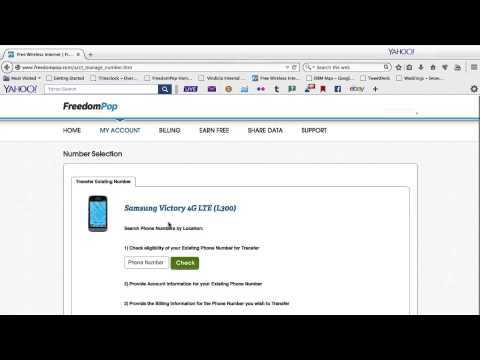 I did all the research on Freedompop site to find out about porting out number. I followed all the instructions but no luck. Invalid PIN. Your kind assistance would be greatly appreciated. Thanks. Got your message, Glad we was able to get you set up with a Pin! Have a Great Rest of your week!